Make sure to follow me on Instagram @lipgloss_and_lace to see what I’m up to while we’re there! Really loving this T-shirt so much! Have an amazing time at Lake Tahoe! Love this casual look! 🙂 Isn’t it true with the shirt! Hope your trip is super fun. Have a wonderful rest of the week! Such a cute tee! And now I have that song stuck in my head, haha! That shirt is my life! Those pants look so comfy too. I hope you have a great trip! I can’t wait to follow along on IG! Oh girl, I hope you have a most wonderful and relaxing time in Lake Tahoe! I seriously need that T-shirt in my closet! 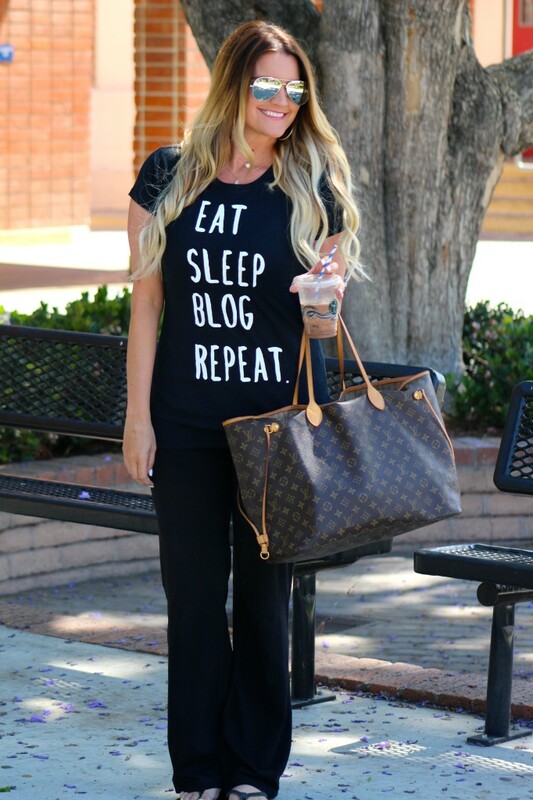 Isn’t it the truth, hope you do something, and we blog, and we do something, then blog! You look adorable and I hope your time away is filled with fun, laughter and beauty! I love that tee and your comfy look here. Have a safe and fun trip. Haha I love this shirt! It’s so perfect! Have a great trip! Blogging can really be time consuming, right? you look great! I love your long hair. What a cool t-shirt! I would love to wear this! That fun tee is so great. Have a nice time and enjoy! 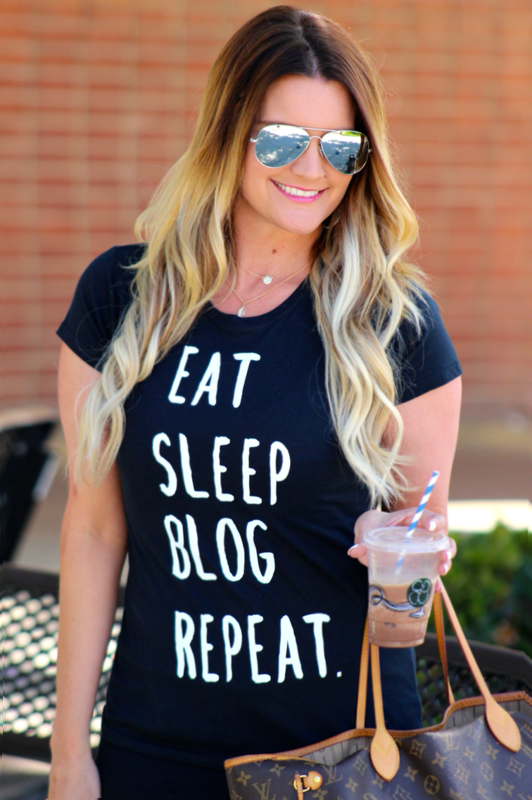 Hands down, I think it should be a requirement that all bloggers own this shirt. too cute! I think I need that t-shirt in my life! You look so cute and comfy! Love this adorable tee!! So cute!! Down Days are necessary at least once or twice bi-weekly. Love that t-shirt. I need it lol. Cute shirt hon I love the relaxed look, what would we do without the down days huh?. I hope you have an awesome trip have lots and lots of fun. That shirt is just PERFECT! I so need it! Fun to see a fashion blogger in yoga pants 🙂 Because, let’s be real, we all wear them! I love the ones from Victoria’s secret. 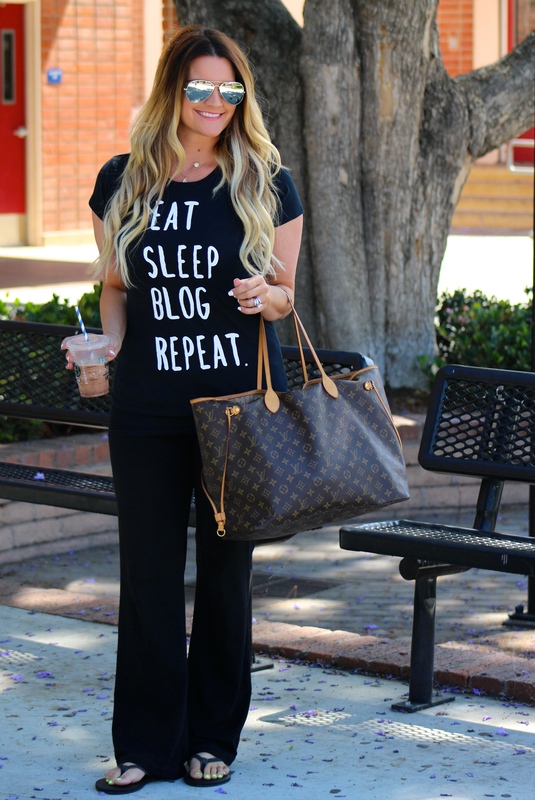 That top is so fun and your LV tote is gorgeous! I need that shirt, so perfect! thank you for your visit….have a lovely day! Perfect travel outfit! Have a great time in Tahoe! Love your casual weekender style here! What a casual and comfortable looking outfit. And I love the shirt!